Hello everyone. First, I'd just like to say thanks for all the kind words I received about my 1000th post video. It took a good deal of time to put together, so I'm glad you all enjoyed it. That said, now it's time to move forward with this week's gruesome tidbits. A link to this vintage UK PSA for water safety popped up in my Facebook last week. Okay, getting Donald Pleasance for the voice of death was a stroke of genius. I am wary of water at the best of times, but if I'd seen this as a kid, I doubt I ever would've learned to swim at all! As if the initial posters for the upcoming flick Cabin In The Woods weren't cool enough, Mondotees came up with their own interpretation. Naturally, the number offered up online last Friday sold out in minutes, but apparently there is another batch going onsale on the 11th. Stay tuned to their Twitter feed, for more info. Cabin In The Woods hits theaters this Friday, so look out for my review the day before. A teaser trailer for the Icelandic horror flick Frost hit Twitch this week. I know what you're thinking, 'oh great, another found footage movie.' Well yes, there's that. Me? I'm a sucker for Icelandic films in general, let alone genre films of this ilk, so I'll definitely be keeping a lookout for this one. Coming to this year's Tribeca Film Festival is this little genre-bending indie, Resolution. This combination of buddy flick and supernatural horror has me very intrigued. After reading this article about the grass-roots philosophy of Justin Benson & Aaron Moorhead, the two guys behind this film, it's hard to not be a little excited about it. I say good luck to them, and I hope Resolution makes its way up here soon. Speaking of things on the festival circuit, if you're attending the Chicago FearFest next weekend, be sure to check out Toronto filmmaker Richard Powell's new short Familiar. Here below is a clip. 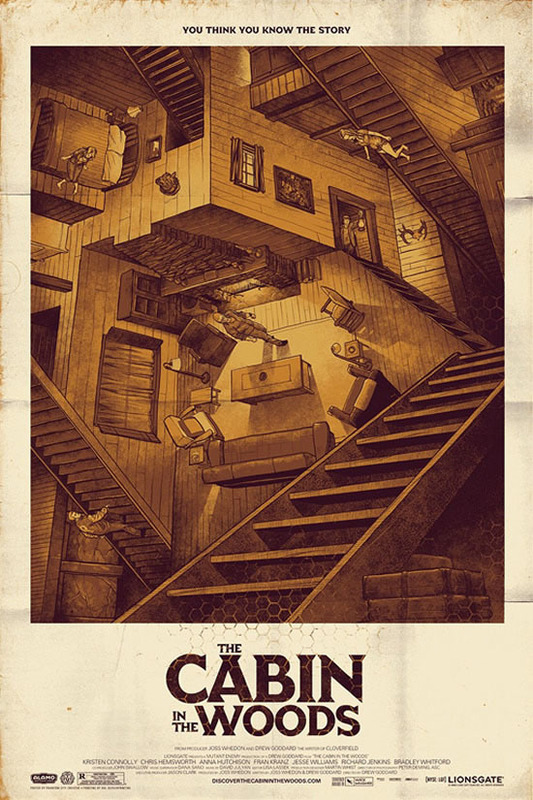 WOW that Mondotees poster for CABIN is glorious. It's even got a slight '80s vibe. Sweet.